The New York Mets woke up this morning with a four-game lead on the second-place Washington Nationals and three games coming up against them directly; these being the Mets, the question of the day was whether they were fucked as of right now, or about to set up some greater act of late-September fuckery. Going by this afternoon’s game, they don’t seem to be fucked as of this second, and maybe they actually aren’t, broadly speaking, because the Nationals are every bit as absurd as they are. Three pitches in the Mets had Curtis Granderson on third base via a double and a wild pitch and managed not to score. The Mets hit three solo home runs off Nationals ace (?) Max Scherzer in the first four innings. 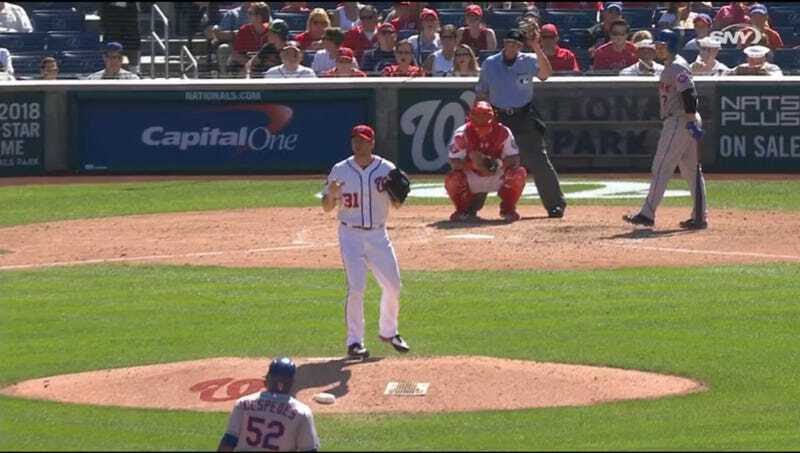 Scherzer struggled to retire Mets not-ace Jon Niese, running a full count and pumping in 95-mph fastballs only to see them effortlessly fouled off. Niese, perhaps returning the favor, actually walked Scherzer and then walked Anthony Rendon, putting two men on ahead of Bryce Harper, who’s basically hitting like Ted Williams in his prime this year. Niese gave up the lead with a grand slam and then gave up a single, around which time Mets manager Terry Collins figured it might be a good time to get someone up in the bullpen. Nationals manager Matt Williams left Scherzer in to hit in a one-run game with two on and one out; by this point Scherzer had, in addition to struggling to retire Jon Niese, given up a half-dozen extra-base hits. Scherzer balked Yoenis Cespedes to third, setting up a run-scoring sacrifice fly. Collins brought in Dario Alvarez to make the fifth appearance of his career, and first since a brief stint a year ago*, against Bryce Harper, who’s basically hitting like Ted Williams in his prime this year, presumably because he eats spaghetti with his left hand. Williams used four pitchers to face four batters, during which time the Mets took the three-run lead that would hold up until the end of the game, proving that God is real. Other stuff happened, by which time I had a saucepan on my head and was hitting it with a wooden spoon. There were furrowed brows, dubious bunts, errant baserunning calls, flailing strikeouts and much more in this game, and for large stretches of it you got the idea that neither of these teams would ever, ever accept victory, which maybe they won’t. One of them (the Mets) is going to win the National League East, though, and if you can’t quite picture it, it’s still true. How it will be clinched one can only imagine.